Yesterday was a great day. As you probably know, I'm at the ShareFEST Conference in Center City Philadelphia, networking with life sciences professionals and demonstrating how ProtoSphere can help them speed collaborative decision-making around all phases of their product life cycle by getting more out of their SharePoint investment. One person I had the pleasure of chatting with was Mike Gannotti, Principle Technology Specialist at Microsoft, and the company's chief SharePoint evangelist in life sciences. He sat in on my presentation yesterday morning about Merck's use of ProtoSphere to conduct the industry's first virtual poster session. 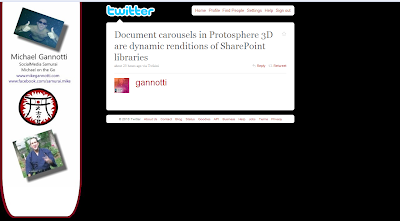 I also demonstrated ProtoSphere's SharePoint functionality and how users can bring documents into their virtual environment using the Media Carousel. My presentation went great, and it made Mike's Twitter stream. Here's what he had to say. Last night, Mike and Dux Raymond Sy, Project Management Professional for SharePoint, aired a live webcast from the show about SharePoint and how it helps life sciences professionals comply with federal regulations. They also talked about my ProtoSphere demo from earlier in the day, and Mike got the discussion going by saying, "That rocked my world!" Thanks, Mike. I'll have to play some tunes on my guitar for you sometime. That's where I really like to rock out. Mike and Dux recorded their webcast, which you can watch below if you missed it. We'll have more from ShareFEST on the blog soon. If you're at the show while you're reading this, look me up at booth #2. Ciao for now! Ron: I enjoyed your presentation as well and we talked it on Mike and Dux's beercast last night. He said, "it rocked my world." Hope to get a demo over at Telerx.